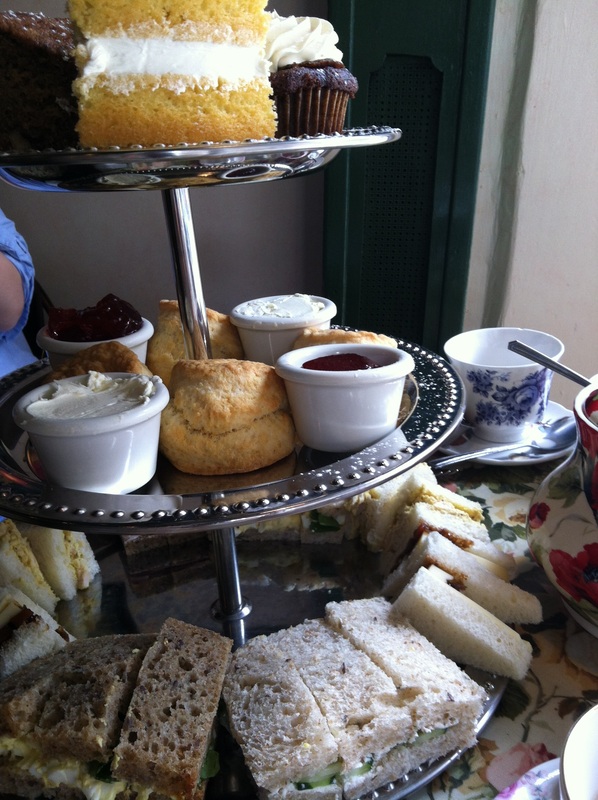 Several things made this afternoon tea at Tea & Sympathy special. One, I was accompanied by Jee. Two, I enjoyed afternoon tea service in the morning. Three, I saw the cutest dog sitting in an equally cute car. And four, I tried a new tea blend - more on this below. 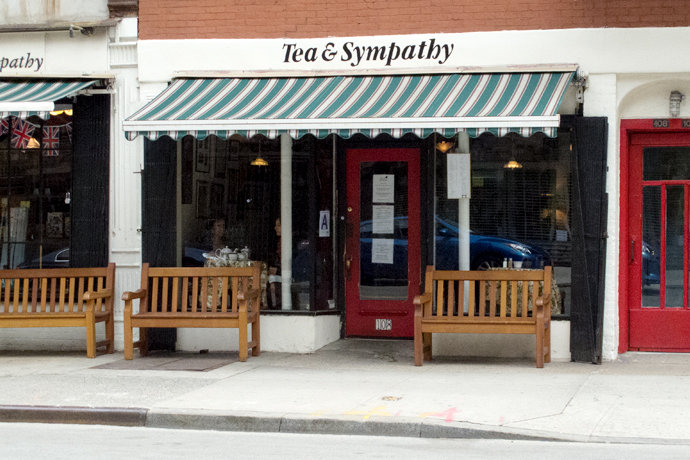 I happily accepted Jee's invitation to Tea & Sympathy last week. (You can read her review of the experience at Oh, How Civilized.) I had been wanting to try the service here. We sat in the right window seat, a cozy but bright spot. We planned to share the Afternoon Tea for One but both wanted different sandwiches (I wanted non-meat sandwiches) so ordered separately. In retrospect we should have shared. The meal was generous. We were full about half-way through the service. 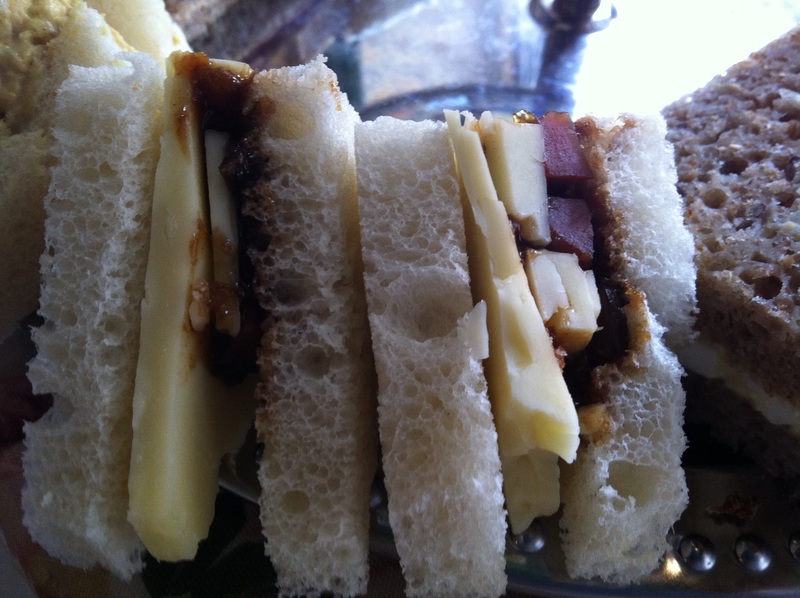 Of the three sandwiches I ordered, the cheddar and Bronson pickles on white bread was my favorite. Lots of sharp saltiness and tang. My second favorite was the egg salad sandwich. It was deliciously creamy and the brown bread was inspired. My least favorite was the cucumber cream cheese sandwich; the classic tea sandwich, but I did not like the nutty bread. On the second tier of the tray from the bottom were the scones. 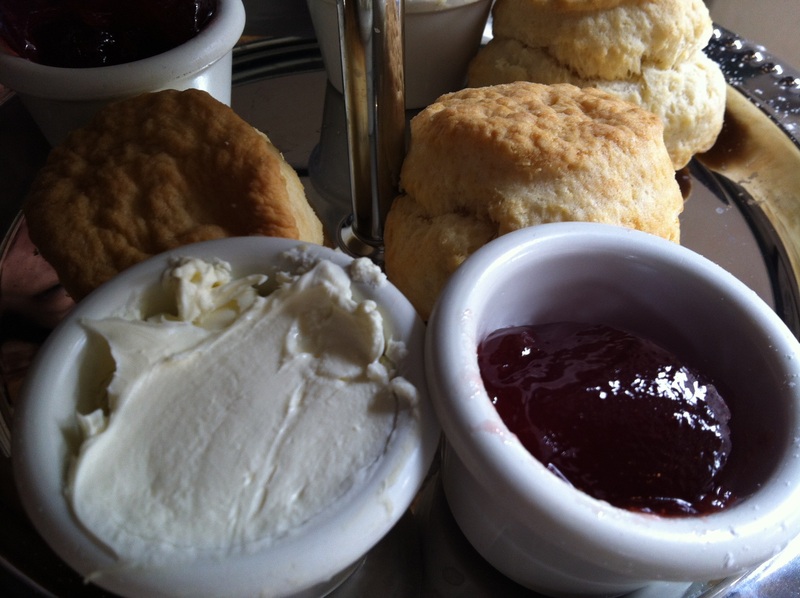 Perfectly sized and served with a strawberry jelly and very thick cream. I wish I could have eaten more but I wanted to save room for the cakes. I liked the pineapple paste on the pineapple upside down cake. 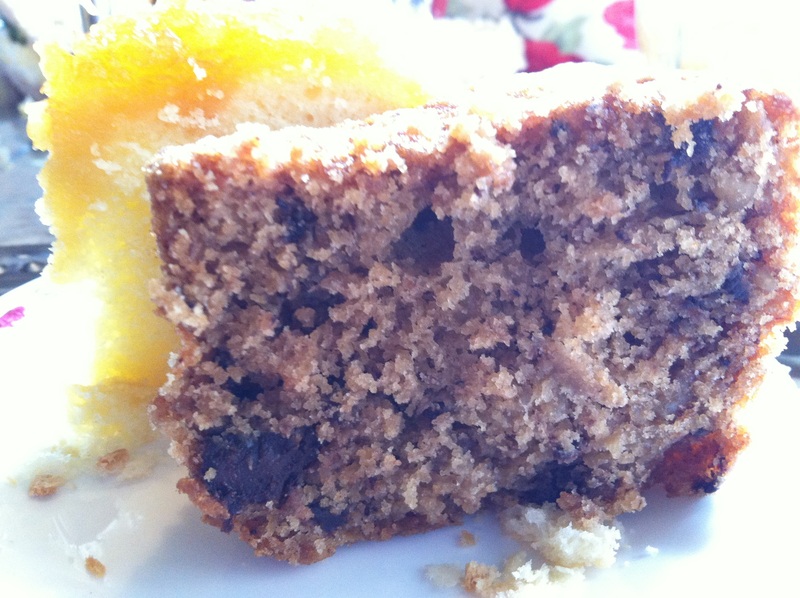 The banana chocolate walnut cake was moist and the soft chunks of chocolate were delicious. I wanted the sticky toffee pudding cupcake to be more sticky and to have more toffee flavor. My favorite was the Victorian sponge. A moist two layer cake with cream and jam filling. And finally, the tea. We both chose the Rosie Lee so were served one large pot of tea. 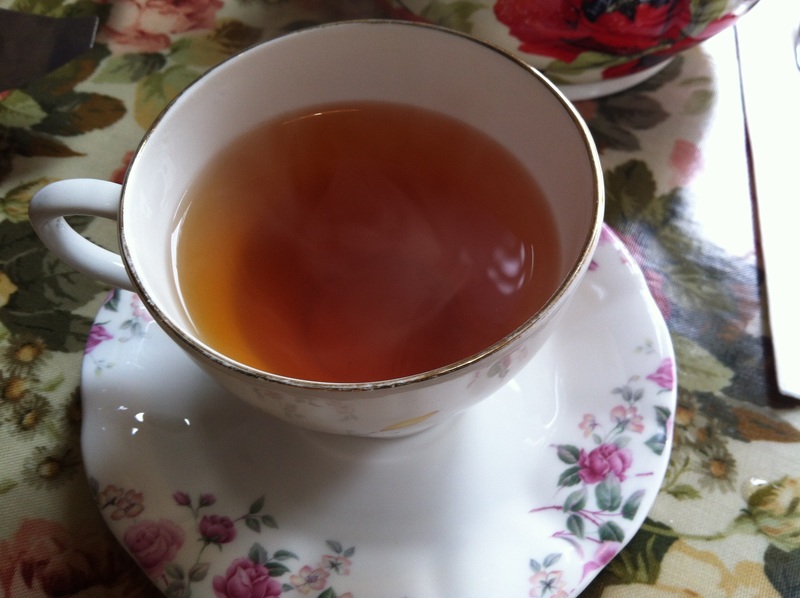 Rosie Lee is a house blend of Earl Grey and English Breakfast. The Earl Grey flavor was subtle. The early pours were mild but mid-way through the pot, the flavor deepened. It's a really good blend. It complemented the savories and sweets and handled milk well. The Rs loved the leftovers and I must go back for a jar of the Bronson pickles. Great review! I have to go back for a small jar those pickles you loved.